Most users see us from a single platform perspective. They download one of our apps, create an account, and then engage with only that one app. In reality, we have several different community based apps, and their existing login credentials can be used to immediately access all of them. The user isn’t understanding that each app is part of a larger ecosystem. This is evident due to the excessive email validation errors we’re seeing, and the registration drop-offs they’re causing. We needed to find a way to inform the user that they can simplify their onboarding experience by skipping the sign up process. There are two ways we could solve this issue. The first is to brand our top-level network, and inform the user that they are creating a network account as opposed to an app account. Then when they download a new app, they’ll recognize the network branding and know to log in as opposed to sign up. An example of this is Game Center on iOS. When you first open a new game, you recognize the four colored circles in the logo, and log in with your Game Center credentials. While that would work, it also adds complexity to a flow that demands simplicity. We didn’t feel the user needed to know that much information, and should instead just quickly get into the community. Each user that downloads our app, but never makes it in, is a huge missed opportunity. With that in mind, we chose to use email recognition to help fast track existing users. 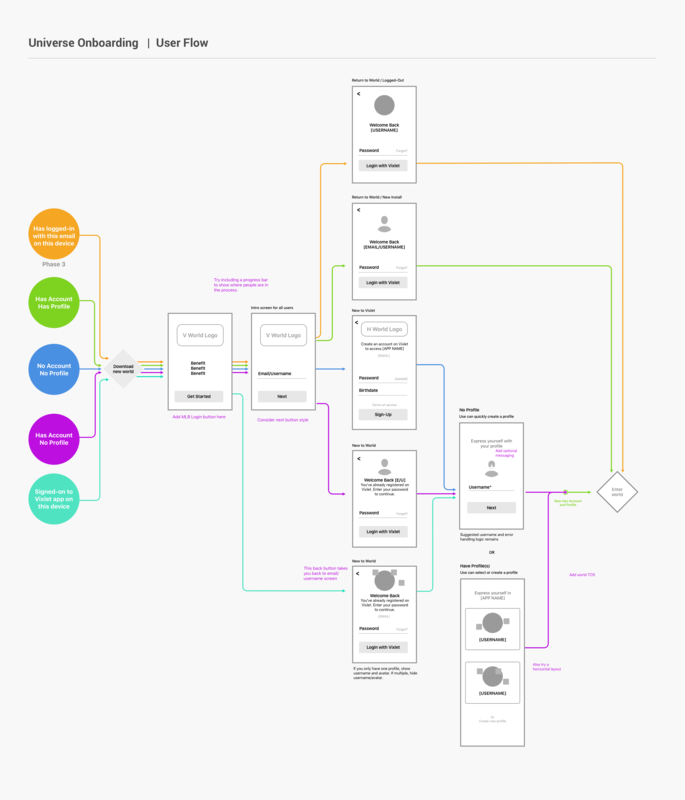 I laid out each user story to see how they could benefit from the new flow. On screen two, you can see the user’s only task is to enter their email address. With that information they’ll be directed to one of four different paths. When an existing user is detected, we use “welcome back” messaging to let them know they’re in our network. We also feature branding on the log in button for recognition. This update is being developed now, and should go live in two weeks. At that time I’ll update this post and let you know if we met our objectives of reducing registration drop-offs, and reducing email validation errors.